Many people, myself among them, were initially turned off by Carrie Fisher’s Postcards from the Edge. Oh no, here comes another Hollywood star who thinks she can run the gamut of the arts. Even though the book was a bestseller when it was released, I couldn’t change my initial (and, admittedly) biased opinion–50 million Elvis fans can be wrong. Even when Surrender the Pink, Fisher’s second novel, appeared and garnered acclaim, I wasn’t satisfied. But then Postcards from the Edge was made into a film with Meryl Streep, and, needing a film to see, I went. And what transpired on the screen (from a screenplay by Fisher) was enough to break through my bias. Postcards from the Edge is quite different from the movie, however. The movie has a linear story that is quite clearly autobiographical for Fisher–Suzanne Vail is a young star who undergoes a stomach pump, then drug rehabilitation, and it all is the result of early fame and a famous mother that the star has yet to really come to terms with. The book, although similar in parts, has a “postcard” feel. The early section is told through the diary entries of Suzanne and Alex, an addicted young screenwriter. Later sections, told only through the point of view of Suzanne, range from entirely dialogue through more traditional third-person narrative. Fisher understands the process of addiction, that searching for escape, then denial, then endless justification. Her portrayal of drug addiction goes beyond drugs–I’ve never taken any, but I could see the patterns of addiction in terms of my many vices. She also understands the glad-handing movie culture enough to be able to depict it as glamorous, while also showing the pimples underneath. Bret Easton Ellis has nothing on her one scene of Suzanne going shopping: the brand names, the non-sequiturs, the endless vagaries are all things he would have died to write. Carrie Fisher has a way with words. She’s not the next Dorothy Parker, but there is a fine example of wit in Postcards from the Edge. It’s a wit measured by the 80s, by her experience, and by her personality. Ellis can’t match it, because he hasn’t lived her life. 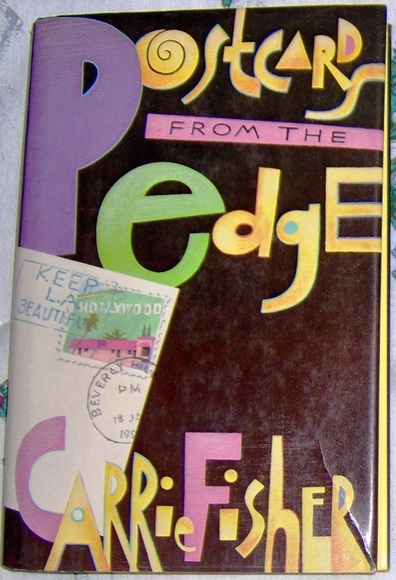 And that’s what makes Postcards from the Edge special: it is a book that was written by the only person who could write it. That is, it is unique. And, frankly, that’s more than can be said for many books published these days.